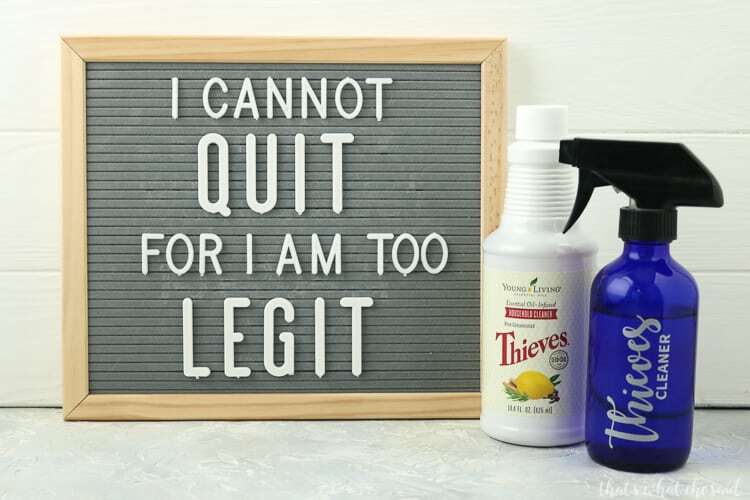 If you are looking to rid your home of harmful cleaning chemicals and replace with a plant-based powerhouse of a cleaner than Thieves® Household Cleaner is the answer to your search! I am here to show you exactly what can Thieves Household Cleaner clean! It would probably be faster if I told you what it didn’t clean…I actually haven’t found anything yet! Note: Read below to see how you can get a free bottle of this amazing cleaner for yourself! This post contains affiliate and/or consultant links. Using these links, I earn a small commission at no additional cost to you. After much, much hesitation and much, much MORE research I decided to give essential oils a try when I was at my wit’s end regarding the behavior of my spirited oldest child. That decision has not only change my life for the better but changed my entire family’s life! I am now not sure how we ever made it without oils! 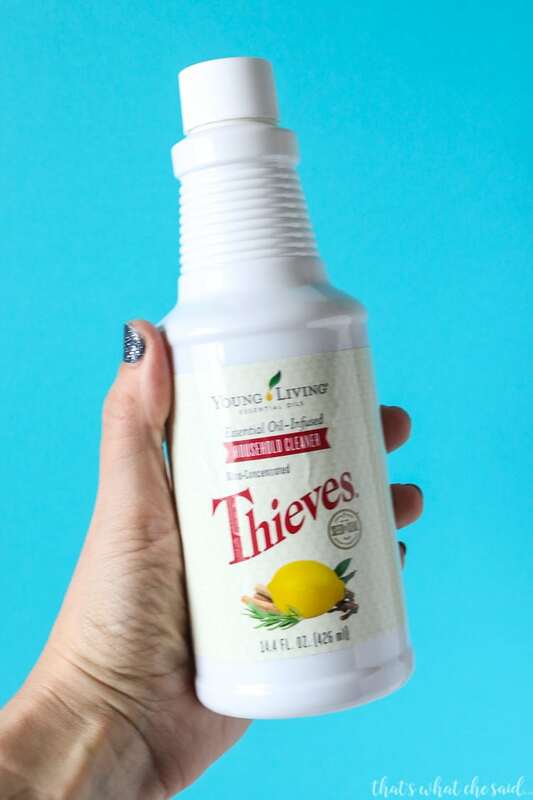 I use Young Living brand of essential oils and a part of that amazing family of wellness products and essential oils is this magical bottle of Thieves Household Cleaner. Thieves Household Cleaner is made with Thieves essential oil blend, one of the most amazing oils I have ever used. You can read more about its awesome properties here. The fact that this awesome oil is part of a 100% plant and mineral-based cleaner had me at hello. This lets me deep clean my house without worrying that I am subjecting myself and my family to harsh chemicals. It is safe to use on my countertops, high chairs and in my refrigerator, where I know it will be in contact with the food we eat! Lemon is also a part of this wonderful cleaner so it smells amazing when you are doing chores…silver lining right? The bottle is purchased in concentrate and you can dilute to different ratios depending on your task at hand. I use this in the bathrooms, living areas, kitchen, outdoors, in our vehicles, pretty much everywhere! I am sharing everything that I use this awesome cleaner for and have provided a helpful printable below for your own use! 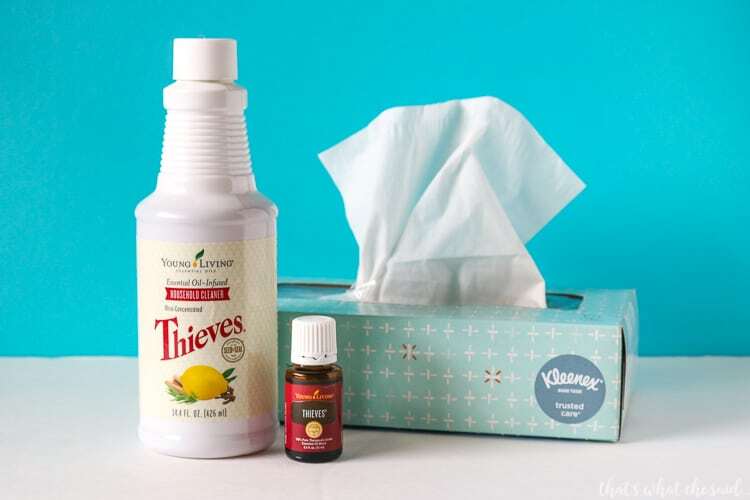 I am certain that this cleaner along with my essential oils are the main reason my family has been on the healthy side of the germ pool these past few years. We diffuse thieves in the bedrooms at night and use the cleaner every day. The hubcaps of your vehicle! Gets them sparkly clean! I use it in my carpet cleaning machine and as a spot remover. Cleans carpet and upholstery spills and stains. (AWESOME for my microfiber sofa and loveseat! Sanitizes/refreshes stinky little boy play outside all day tennis shoes. Sign up here for a new account with member ID 2388478 as both the enroller and sponsor by 11:59 pm CST February 25, 2018. Then send me an email to cheryl @ thatswhatchesaid.net and let me know you signed up and your new member #. Curious about that wholesale membership?! Let me tell you that you never have to sell a thing! Never. I don’t lie! If you do decide to jump into the business side and share with your friends, I can help you too but I will never ask that you sell a thing if you don’t want to! You can see exactly what you get in a Premium Starter Kit here in detail! Don’t want a whole kit but want to try this amazing cleaner? I can help you there too! 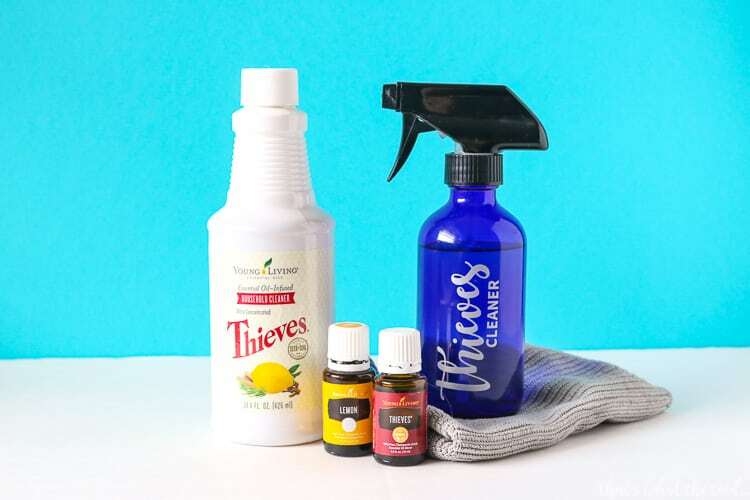 Sign up for a RETAIL account using member# 2388478 as both the sponsor and enroller and purchase a bottle of Thieves Household Cleaner at retail cost. Send me an email and I will send you a free oily goody! You will not receive the wholesale discount of 24%, the awesome oils, the home diffuser plus samples this way, unfortunately. There is also a Thieves Starter Kit if you are interested in that as well! I will still send you a bottle of the Cleaner so you will then have THREE bottles in your stash! I use every single one of the Thieves products in my home! I am here to answer any questions you may have!! You can download my cleaner printable below. I laminate this and hang it inside of my cabinet for easy reference! This offer is only valid for new members and before the time cut of. US residents only at this time. Offer void where prohibited. Free bottle of Thieves Household Cleaner will be sent approx 3 weeks after sign up. Download my favorite 10 Dilution recipes for the most common household cleaning areas. PIN WHAT CAN THIEVES CLEANER CLEAN?